Oscar night wraps up the 2012 awards season and I guess its about time I get in on the fashion action. I have not read anyone elses fashions reviews yet, so we'll see if my hits and misses are in line with others. I'm actually looking forward to hearing what Joan Rivers has to say about everyone, she is always so funny. The ladies from The Help were the big winners for me. Even though I thought Viola Davis was robbed of her Best Actress Oscar (how amzing is that green on her!?!) all 4 of these ladies looked amazing! Jessica Chastain was not my favorite at the Golden Globes, but last night she got it right. And Emma Stone is so funny, I really love her and her red dress. The Help cant be mentioned without talking about Octavia Spencer- she looked amazing, her speech was great and I was so happy for her! Not all my favorite. I love these ladies but I was not such a fan of all their fashion choices last night. Althought I wish Kristen Wiig had her hair up at least she wasent wearing a choker last night. Maya Rudolph looked hot- hottest I've seen her in awhile- loved that purple on her. The rest of the ladies were just mehh to me. Ellie Kemper's bangs were just too harsh for me. But, I think that color dress looks amazing on her! I loved Rose Byrnes dress, but whats up with those shoes? I LOVE Melissa McCarthy, she is one of the funniest ladies on TV, but her dress was just too much for me- the sleeves were wings & not the pretty kind. And I dont have any complaints about Wendi's dress, I just wish she wore some earrings or a necklace. She just looked naked to me. I have not seen The Artist yet, I still have mixed feelings the whole silent movie thing, but I HATED all of these dresses. That mint green color can be beautiful, but yuck! And Penelope Ann Miller had AHHHMAZING earrings on but her dress and that headband were just not working for me. These two ladies, who are slightly older than the rest, looked stunning in my opinion. That neckline on Glenn Close is just outstanding and while I know people may disagree with me I think that Meryl Streep looked her best last night. Compaired to what she wore to the Globes this is a complete 180, rock on Meryl! Nothing surprising from Tina Fey, looks like she does at every other award show, although I do love her hair. Sandra looked beautiful in the black and white number. The top was slightly baggy for me, but that belt was rockin'! And while this PAINS me to say it (I'm still team Jen) Angelina was beautiful. I mean her leg, the lips (I know we've seen them before) and of course her date, she really looked stunning. These go in order from love to hate. Giuliana was glowing, and that neckline was PERFECTION! I might have liked her hair better if it was not has slicked back, but overall she was beautiful. Cameron was just ok. The bottom of her dress was pretty, but the top was plain and I hated it. JLo I love you, but what what were you thinking? Not at fan of anything here. Again in order of love to hate. Gwyneth omg how I love you! That cape was just Red Carpet royality looking. Only someone like you, with that amazing body, could pull something off like this. Seriously I cant get enough of this dress! Kelly Rippa has a body to die for and anything looks good on her. And Rooney Mara, is that you or your ghost? I cant tell where her dress ends and her skin starts, they are the same color. Not a fan. I like you better in black. No order here, I only LOVED Michelle Williams dress here. She has totally not been my favorite at past award shows, actually might even be my least favorite dressed but I just LOVE this redish/coral number she wore last night. Perfection! The rest are mehh- Nothing special, I dont have strong HATE feelings but they arent memorable either. What did you think about last nights fashion and the winners and losers? Mostly agree... my best were Michelle williams and Gwyneth. I loved the color of violas dress, but the actual dress was weird at the bottom. and my worst was JLo. I didn't like J Lo's dress at all. I liked Michelle Williams but didnt like the bow brooch. It looked silly to me. I loved Maya Rudolph and Penelope Cruz. I forgot about Guiliana- she looked amazing! I did not care for Gwyneth or Angelina. I think that Natalie Portman always looks like that so it was nothing new. Penelope Cruz was wonderful. It pains me to say this because I love Sandra Bullock but I think that the dress was not a good fit and her hair and make up were a bit too severe. Glenn Close was fine but Meryl Streep was a mess. Octavia Spence was wonderful and I thought that Jessica Chastain and Emma Stone were good too but the Viola Davis look not so much. Gosh, best review yet ! Just one thing : what on earth was wrong with Angelina Jolie ? She's usually so elegant, was her dress so ill-fitting that she had to stand in such a peculiar way ? (I didn't see her !). As far as I'm concerned, Emma Stone can do no wrong. She's got style and personality to boot. And Michelle Williams is so perfect in so many ways that I want to replace Busy Phillips as her BFF. I have to say I adored Penelope Cruz, she looked very elegant and regal. The lavender gown and her hair; perfect. I love Meryl; however her dress looked a size too large and dare I say a bit matronly. Love your review! I was appalled when most of the recaps today stated that JLo was "best dressed" with Jolie as a close second. What?! Craziness. Emma Stone was stunning and my favorite of the night. I like pieces that make the statement! Great review! I LOVED Gwyneth's dress! She was perfection and I think Glenn Close looked better than ever - just beautiful! As for Angelina and the leg drama...not a fan. agreed...i thought maya rudolph looked amazing! so many of these actresses are just too skinny and she actually looks like a real woman. Great breakdown of the Oscar's best and worst dressed. Check out my date night outfit inspired by Jessica Chastain's Alexander McQueen dress! i agree with so much of this! my favorites were octavia, sandra, and angelina - stunning. also agree that meryl and glenn looked so classy and age appropriate - beautiful. 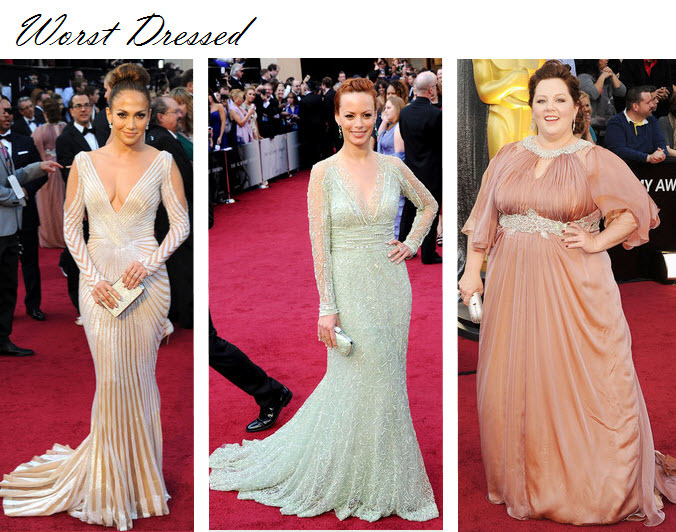 i also looove melissa mccarthy but that dress was not doing her any favors, and wtf was up with cameron and rooney! ?